Unisex Hoodie is in stock. We will print it as soon as you order it. Colour and fit very well! The main issue that the lettering on the front is way off centre and it looks weird. It is very noticeable as well! I ordered two hoodies for two kids going on your messurements. I was hoping the one for my daughter would be over sized and it fits but would of liked it much bigger and same for the other child. 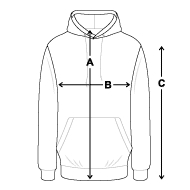 I compared your sizes with hoodies she wears and it said it would be much bigger. Although I orded a large I would of liked it a bit bigger. I fits just right it's just my preference to have it bigger. I will order x large next time.